Well if you believe the Old Farmer’s Almanac, the 2018-2019 winter in New Jersey will be warmer than usual and while it will be a wet one, we will have to deal with rain more than snow. Even though Old Man Winter won’t hit us too hard this year, energy bills during this season can still put a crimp in your budget. From heating costs to holiday decorations spiking your electrical usage, ‘tis the season of hidden expenses. Here are ten tips to control those bills to keep your budget in check. 1. Let the Sun Shine In – Mother Nature can help control heating costs. It’s as easy as opening the curtains on all south-facing windows in your house so the warm rays shine into your home. Conversely, shut them after sundown to keep the heat in. 2. Adjust Your Thermostat – You can drop your heating bill by 10% by turning your thermostat down 10-15 degrees for at least eight hours, according to the U.S. Department of Energy.1 Installing a programmable thermostat makes this easy and helps year-round. These “smart” utilities can automatically drop the temperature while you are sleeping and at work and raise it while you are on the way home, so it is warm when you walk in. 4. 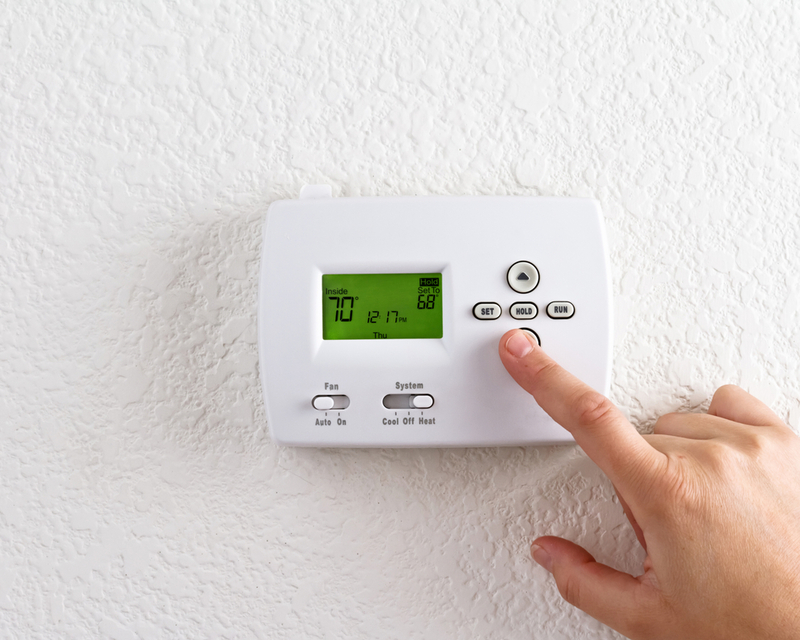 Give Your Furnace Some TLC – Make sure your heating system operates efficiently. Natural gas-powered systems should be serviced every two or three years; oil-fired systems need an annual tune-up because they burn dirtier. Check your furnace filter each month and replace it when it gets sullied to let the hot air more easily flow through the vents. It also reduces strain on your furnace, which can lower maintenance costs and extend its life. If you own a wood- or pellet-burning heater, clean the flue regularly. Also, scrub the inside of the stove with a wire brush to ensure home-heating efficiency. 5. Don’t Get Caught In a Draft – As much as 25% of your home’s heat loss can be due to drafty windows and doors, and other gaps in your house, such as utility cut throughs for pipes, chimney spaces, recessed lights in insulated ceilings, and unfinished spaces behind cupboards and closets.2 To solve this problem, walk from room to room when the outside temperature is at least 30 degrees colder than in your home. If you feel cold air, you have found a spot that needs repair. Add caulk or weather stripping to seal air leaks that don’t pass the test. You can also visit one of the many hardware and home improvement stores in North Jersey to purchase an indoor window kit to reduce drafts. 6. Build a Buffer – Heating (and cooling) costs can be slashed by 30% by making sure your home is properly insulated, according to the Department of Energy.3 This is particularly true for homes that were built more than 25 years ago – of which there are plenty in northern New Jersey. The cost of the install is softened by the fact that it is tax deductible. Insulation installation should be done throughout the house – attic, basement, crawl spaces, and ceilings. Energy Star has recommendations for the type of insulation to use depending on where you live. In Bergen County, the R-value is between R49 to R60 for uninsulated attics and R38 to 49 if there are up to three inches of existing insulation. 7. See the (LED) Light – If you haven’t already switched your holiday lights from incandescent bulbs to LEDs, now is the time. LEDs use at least 75 percent less energy and last 25 times as long. Plus, they don’t emit as much heat and don’t break as easily as incandescents, making them a safer alternative. 8. Don’t Watch Money Go Up the Chimney – If your home has a fireplace, keep the damper closed when it’s not in use. When you are cozying up to a fire, open dampers in the bottom of the firebox (if you have them) or open the nearest window about an inch. Also, close doors leading into the room and lower the thermostat to around 55 degrees. All these steps will reduce heat loss. 9. Don’t Get Burned by Water Heating Costs – Nothing beats a hot shower on a cold winter morning but it’s not as nice as having a few extra dollars. Water heating costs are about 11% of your utility bill, according to Energy Saver, so make sure you water heater is set to 120 degrees.2 Also consider a tankless water heater, which heats water on-demand compared to a traditional water heater that maintains a full tank of warm water. 10. Humidifiers – Moist air retains heat better than dry air, so a humidifier is a wise investment because it will make you feel more comfortable when the thermostat is lower. Looking for an environmentally friendly alternative that is also aesthetically pleasing? Add some house plants to achieve the same effect. Learn more about NVE Bank by visiting our website, stopping by one of our convenient neighborhood branches, or calling 1-866-NVE BANK (683-2265) to speak with a branch associate. This entry was posted in Budgeting, saving money and tagged "savings tips", budget tips, energy costs, heating bill, lower energy costs, lower heating bill, winter savings. Bookmark the permalink.